COLUMBUS, Ohio—Building on 50 years of partnership with The Ohio State University College of Food, Agricultural, and Environmental Sciences (CFAES), the Nationwide Foundation is contributing $7 million to support the college’s vision of a modern land-grant institution with a mission to sustain life. The Nationwide Foundation gift supports initiatives in translating research and making it accessible, strategic collaboration, workforce development, and new facilities. This new gift brings total contributions to $11.8 million for the CFAES collaborative over the past several years. The largest part of the gift, $5 million, supports constructing new facilities and infrastructure at Waterman Agricultural and Natural Resources Laboratory, a key asset on the Columbus campus and essential to our comprehensive university. At Waterman, CFAES operates a unique hub for teaching, research, and extension. Last year alone, more than 100 active research projects, and more than 200 outreach programs in the areas of turf science, dairy management and research, entomology, ecological engineering, agricultural systems management, sustainable agriculture, food science, medicine and behavioral science, and agronomic and horticultural production practices took place at Waterman. Waterman is also home to a multitude of college-credit courses encompassing everything from beekeeping to biogeography. Nationwide Foundation’s lead gift will support CFAES’ goal to engage every undergraduate student in some aspect of the Waterman experience dedicated to food security, production, or sustainability during his or her time at Ohio State. The plan for Waterman includes a Controlled Environment Food Production Research Complex with a state-of-the-art greenhouse production system. 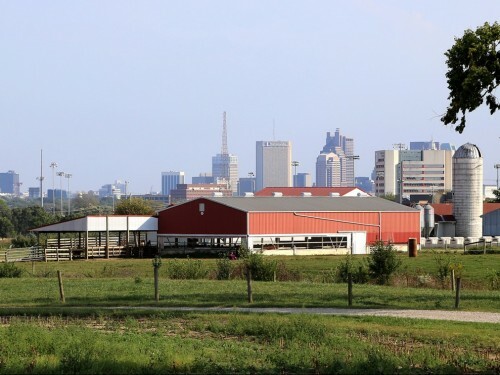 In addition, there will be a new multispecies animal learning center, the Kunz-Brundige Franklin County Extension Building, which is currently being built, and a modernization of the dairy facility. With the remaining $2 million, the Nationwide Foundation is contributing to programming initiatives focused on the land-grant mission, including translating research to ensure its accessibility and utility, broadening lifelong learning opportunities to strengthen the workforce, and strengthening leadership programming for CFAES students. These initiatives include combining an integrated team of researchers, data scientists, and communicators to manage a robust digital knowledge exchange to respond to public needs and highlight relevant research and data. Also included is the coordinated development of emerging talent, leaders, and workforce through educational, training, and certification programs, with innovative research through the college and programming that emphasizes career exploration and college preparation through Ohio 4-H. The Nationwide Foundation is a nonprofit, private foundation to which Nationwide companies are the donors. Founded in 1959, the Nationwide Foundation has contributed more than $467.3 million since 2000 to help nonprofit organizations in communities where Nationwide associates and their families live and work.